Well, there you have it! 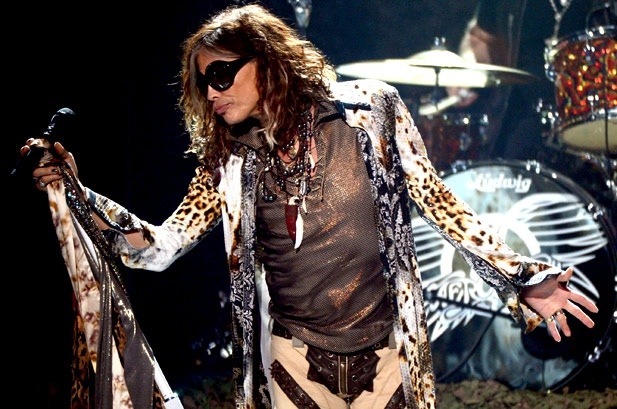 Steven Tyler has waved goodbye to American Idol after serving as one of three judges over the past two seasons. I can’t say I am totally surprised and, actually, this was probably a mutual agreement on both sides. American Idol has been making the news as of late, indicating that the show was going through a major re-haul process. So, Steven’s exit seems logical and I would not be surprised if both Jennifer Lopez and Randy Jackson leave the nest as well. Here is the complete story from Billboard.Com. We wish Steven continued success in his musical career. He is now free to devote himself to his legendary band, “Aerosmith“. What say you MCL readers? Are you going to miss Steven? Any ideas re replacements? Comment away. Can’t say as I am disappointed. I just hope they make the right choices on replacements. You already know what I think it would do to the ratings if Adam Lambert came on board. We will just have to wait and see what happens. I too wish Steven all the best with his new concert tour and his future. I liked Steven the 1st year he judged, not so much the 2nd year. It looked liked he lost interest. If the new judges will be Mariah Carey, Fergie and Adam, as I’ve been reading, it’ll be a very different kind of judging since all 3 have been professionally singing from young ages and all 3 are in the late 20s to early 40s age range. Having 2 females and 1 male judge is different, too. Thank heavens the three stooges should all go. Idol definitely needs an overhaul. I cannot stand Adam. He is so over the top. Hope he is not one of the judges. Britney has made a wonderful addition to X Factor. All the three judges achieved was adding to their own bank accounts and increasing their popularity and not adding anything to the contestants. Not sorry to hear that Steven will be leaving and I won’t be surprised if Jennifer leaves as well. But I’m really not an Adam Lambert fan so I’m not too excited that he might be a judge. If they want to invite a previous Idol contestant, I’d rather see Kelly Clarkson. She did a good job on Duets this summer. Well, it seems American Idol wants to start with a clean slate. Both Steven and Jennifer are gone, and Randy may become a mentor. My BIGGEST concern is that the pattern will continue where the judges are more important than the contestants! Seems Mariah’s name has been mentioned a lot. Plus, they are looking for younger judges as seen on some of the other reality shows. I feel Adam would be too polarizing. Many cannot forget that he kissed a guy (band member) on the AMAs. I want him to continue his success in his music career, not judging Idol. KariAnn – I wish American Idol would adopt AGT’s example re the judges’ selection. All three AGT judges are primarily focused on the show – not their careers. Sure, Howie and Howard have busy careers in the entertainment field, but their combined forte is rooted in talk and comedy. And, Sharon, is articulate and fully committed to the performers. They need to attract producers, record moguls or artists who are not trying to sell a bzillion records. This is the key I feel. Shania is too busy with her Las Vegas show which debuts in December, I believe. I just read an article saying that Aretha Franklin would like to be a judge on Idol. They’l probably think she’s too old!! !